Futuristic and ultra-modern. The offi ce complex built according to plans drawn up by Sheppard Robson and Skanska, with around 24,154 m2 floor space and with the address and name ‘One Kingdom Street’, is the most innovative project in Paddington Central. As one might expect, the building’s planners were also innovative in terms of the heating technology – whose eco-friendliness has been awarded a top rating with the BREEAM classification ‘Excellent‘, with the NOx emission values even undercutting the best BREEAM standard by a significant margin. 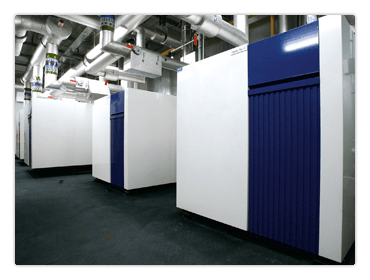 Five RENDAMAX 3600 boilers have been installed – with a connection to the high and low temperature heating circuits. They satisfy all the requirements in terms of efficient heating output and energy management. Three boilers supply the air conditioning and ventilation systems and the underfloor heating for the entire floor space, whilst the two smaller boilers supply the hot water and radiator heating systems.